Renovated East side bungalow walkable to all the Manor Rd hot spots. Original hardwoods, exposed shiplap ceilings, on-trend tile, and ample back yard with gorgeous trees. This is the perfect place to call home or buy for an investment. Updated plumbing, electrical, foundation and much more. Located in North Austin off Anderson Mill Rd in the Greenes community. Spacious 1 story, 4 bedrooms, 3 full bathrooms and a rare 3 1/2 car garage. Guest bedroom with its own bath on one side of the house (MIL floor plan) and a private office. Hardwood floors throughout. Situated at the end of a cul-de-sac. ACTIVE LISTING - 5901 Mountain Villa Dr.
5 Bedroom, 3 bath family home on a large corner lot with beautiful trees. Bright open kitchen with a center island perfect for entertaining. Office and bedroom with bath downstairs. Enclosed garage for extra living space. ACTIVE LISTING - 2618 Fiset Dr. Wonderful light filled house taken down to the studs in 2013 by Stouse Design. 2018 Kitchen remodel, interior paint and custom cabinetry & trim work. 3/2 with 1920 sq/ft. Corner lot with beautiful trees. 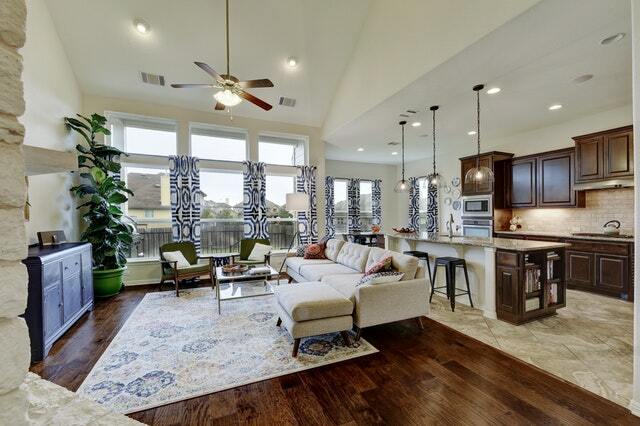 This central Austin ranch has an open floor plan with incredible kitchen and pantry. Great for entertaining. Concrete floors, Premium European appliances, high efficiency AC, tankless water heater. Master suite has large bath with soaking tub and separate shower and a huge master closet. Over-sized two car garage. Located downtown in the Market District, the 360 Condos' is a prime location! Just minutes to Whole Foods, Trader Joes, Hike & Bike trail, Seaholm Plaza, 2nd Street District w/retail & shops, Moody Theater(ACL) and much more. 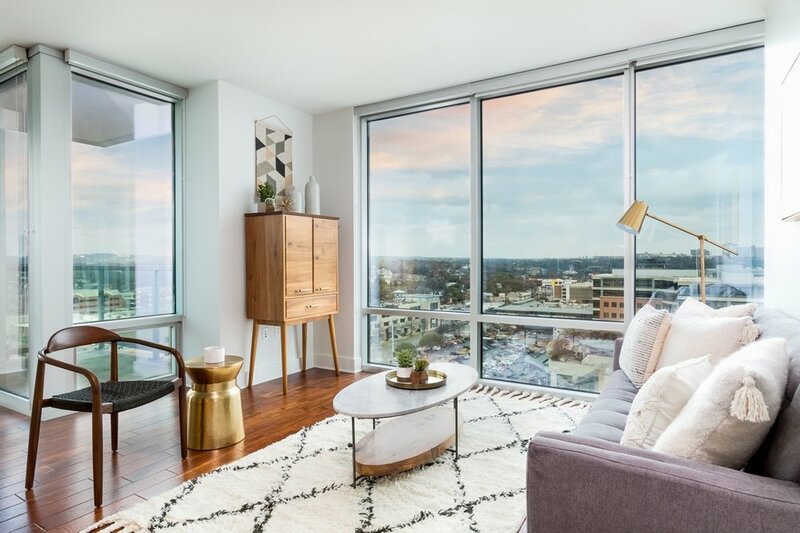 The 2/2, 998 sqft condo features a stunning skyline view, open floor plan w/floor to ceiling windows, stainless steel appliances & granite counter tops. Amenities include 24hr concierge, fitness center, club room, pool, outdoor fireplace w/grills, conference center, & media room. Great investment opportunity DUPLEX ... live in one, rent the other or make it an investment for cash flow. This recently remodeled duplex is in the St. John neighborhood minutes from Mueller, UT and downtown. Both sides feature renovated kitchens, baths, flooring, cabinetry, appliances fixtures & lighting. Open kitchens w/ Quartz countertops, tile backsplash & stainless appliances. Bright, open living & dining areas. Large lot with fenced private backyards and patios for each unit. Amazing value! Bring your builder! Rare opportunity to build on a corner lot in one of Austin’s most prestigious residential neighborhoods. Prime central Austin location with a quick 10-minute drive into downtown Austin. The Cat Mountain Homeowners Association allows access to the clubhouse, community pool, tennis courts, a basketball court, playground and picnic area. East Austin Gem -views from rooftop terrace overlooking Downtown! Walkable to downtown, Hillside Farmacy, Rosewood & Franklin's BBQ. Minutes from Dell Medical Center. Unique floor plan-bedrooms do not share a common wall for added privacy with jack and jill bathroom, wood floors throughout, stainless steel appliances, stackable W/D. Recent updates: freshly painted inside and out, replaced roof, driveway added with carport, attic finished out for storage space. ADA accessible. Discreetly appointed wheelchair ramp and wide doors. Beautiful and spacious home in Cedar Park, offering 5 bedrooms at 3,567 sq/ft. In the family friendly Whitestone Oaks neighborhood with a park and pool nearby. This home is filled with stunning upgrades including tile and travertine flooring, Silverado Hickory wood floors, and Dark Maple-Aged Bronze cabinets. Also, the addition of a 5th bedroom with private bath. This home sits on a corner lot with a spacious front and back yard. Perfect open floor plan for families and/or entertaining. The kitchen offers beautiful appliances and plenty of cabinet space, with a breakfast nook off the corner. High ceilings with recessed lighting throughout the home as well. Downstairs includes Dining room, Master Bedroom and 5th bedroom with private bath. Upstairs includes an open loft/game room and 3 bedrooms with full bath. SoLD - 1907 TRAVIS HEIGHTS BLVD. This stunning home with beautiful curb appeal is located in the very desirable Travis Heights Neighborhood. Only minutes to Downtown, Hike-and-Bike Trail, Big Stacy Park and Pool, and SoCo Entertainment District. Contemporary craftsman offering a spacious design. The main level offers an open floor plan with a formal dining room, living area, 1/2 bath and second dining area/breakfast nook. The kitchen includes upgraded countertops, stainless steel appliances and a center island with cooktop. Also tucked away on the main level is the master suite, with a beautifully upgraded bathroom including an over-sized shower and deep soaking tub. Upstairs, the third floor, has three bright and spacious bedrooms and one full bath. Downstairs, the basement offers a second living area, 1/2 bath and a built-in wine closet. This charming East Side home with guest house is located on a rare full lot with a beautiful, lush backyard ripe for entertaining. Open the red front door and you are welcomed with natural light, beautiful wood floors and reclaimed wood accents. The living room opens to the updated kitchen to create a modern open concept floor plan. The kitchen is equipped with a 5 top gas burning stove, stainless appliances, all white cabinetry, and beautiful butcher block countertops. From your very own fig tree in the front yard to a palm tree and personal herb garden in the backyard, the outdoor space is as inviting as the inside. The beautiful backyard features a private 1 bed/ 1 bath guest house where your guest can happily stay or you can office from home. Walk to all of the best East Side hot spots including Quickie Pickie, Franklin Barbecue, Hillside Farmacy and many more! Unique details bring a certain level of character and coziness to the space including a wood-burning stove in the living area, built-in seating, exposed shelving throughout, an intimate artist's nook, and a free-standing tub in the master bath. The kitchen is pure and simple with stainless steel appliances and black stone countertops. This home also boasts an impressive amount of hidden storage space. Several porches in the front and rear of the home create desirable outdoor living and entertaining spaces amongst the Texas-native landscape. Charming, one-of-a-kind, modern farmhouse located in the sought-after Clarksville Historic District! Renovated by award-winning Avenue B Development, this 2,200 Sq/Ft, 3 bedroom/2.5 bath home combines elements of the original 1920 architecture with beautiful, current design. Long leaf pine, reclaimed wood floors paired with clean lines and bright, colorful hues of blues and greens make a perfect balance of modern and rustic. The open-concept design, soaring 12-foot-high ceilings, and the abundance of windows allow natural light to fill the home with a light and airy feel. Steel and brass accents put a sleek finish on this timeless design. Charming east side home on rare full lot with amazing front porch views of Downtown! Property features main house plus back house with alley access. Zoned to incredible schools including Mathews Elementary, O.Henry Middle School and Austin High School. VERY desirable neighborhood and special property! Walk to all the best East Side hot spots including Quickie Pickie, Franklin Barbecue, Hillside Farmacy and many more! Beautiful northwest facing 2/2 condo with floor to ceiling windows offering stunning views of downtown Austin and Lady Bird Lake. Condo offers a clean palette with rich hardwood floors and fresh white paint. Walk to Lady Bird Lake, the trail system, Whole Foods, Trader Joe’s, the Seaholm District, shopping & restaurants. Amenities include pool, gym, lounge, guest suites, 24-hour concierge & garage security. Unit comes with two, highly sought after, level P1 reserved parking spaces. 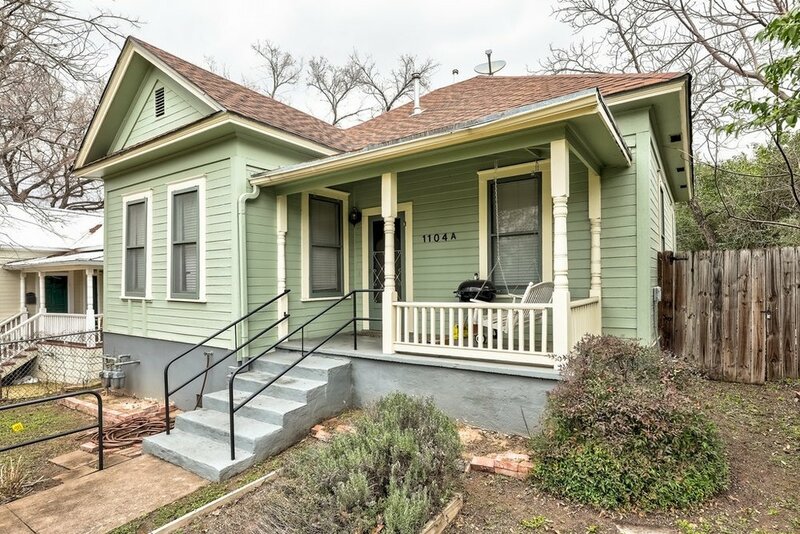 Don't miss this rare opportunity in the heart of Clarksville & Old West Austin! Charming condo in highly sought after central Austin neighborhood. Rare 1 bed/1.5 bath + bonus room with open floor plan and beautiful hardwoods throughout bottom floor. Updated kitchen with granite countertops and coordinating gas fireplace. Natural light fills the space making it feel open and airy. Walk to Clarksville's best destinations including Jeffrey's, Cipollina, Josephine House, Cafe Medici, Fresh Plus Grocery, and many more. Can't beat this location with stunning treetop view of downtown! Lovely home in original section of J.W. Smith's Western Oaks. Only a few of these well-built, four-side masonry homes come available each year. Four bedrooms, 2 baths, living, dining and breakfast room. Spacious backyard that backs to greenbelt buffer, detached 2-car garage. Walking distance to Western Oaks community center. Close to dining, shopping and Mopac access. This 1931 Craftsman home is a rare find with Historic Tax Exemption in place. 0.167 acre with great, flat backyard for possible accessory dwelling unit. A half block from Stacy Park and a few blocks east of SOCO for great restaurants, live music, and shops. This 1,495 sq. foot home has great charm to enjoy or expand! Rare and unique opportunity just five minutes from the "Y" in Oak Hill. This unique and creative space sits on a corner lot on 1.6 acres, and has commercial potential with 1826 frontage. The main area is 1,929 sq/ft. with four office bays and an attached 1/1 studio. The property also boasts and attached 4-car, 1,235 sq/ft. garage. The property has city water + a 10,000 gallon potable rainwater collection system. The property is not restricted to residential use per deed restrictions. According to the City of Austin, it can potentially be used for commercial purposes. Buyer must do their own due diligence. Property is in the City of Austin’s two-mile ET. Sold AS-IS, WHERE IS. Contemporary architecture meets the hip, East Side vibe. These two newly constructed custom homes are stunning from the inside out. With a sleek black and white exterior, the contrast and modern design create unique curb appeal. Both units feature three bedrooms, two and a half baths and a third-floor viewing deck to take in the amazing downtown views. An open concept floor plan makes these homes perfect for entertaining or family time. The kitchen features cool grey tones, chrome fixtures, a beautiful subway tile backsplash, OmegaStone countertops and Bosch appliances. The master sits downstairs with a spacious master bath featuring a shower with frameless surround. Unit A includes a 2-car carport and unit B has a 2-car garage. Walk to all your favorite East Side locations including Quickie Pickie, Franklin's BBQ, East Side Yoga and more! Unique opportunity to own a meticulously built, modern home in East Austin. The smartly designed floor plan makes the home live large, and floor to ceiling windows illuminate the space creating an incredible ambience. Unexpected, expansive views span across the back of the home offering a wide open spaces feel. Attention to detail and a thoughtful layout sets this home apart. Crisp, clean lines paired with natural elements create a very inviting vibe. Fantastic opportunity within walking distance of the Mueller Market District! This spacious home features 5 beds, 3 baths, and sits on a quiet, tree-lined street close to lots of restaurants and shopping. A sizable master is included along with two living areas and a wing of the home that can be closed off for privacy. Enjoy the large mother-in-law floor plan perfect for rental income generation. Beautiful Texas-native landscape in the front with a spacious backyard. Charming craftsman on sought-after Garden Street. 3 bedrooms, 2 full baths, original hardwood floors with lots of open space and natural light. Beautiful design and thoughtful details throughout. Large landscaped backyard with inviting entertaining area. Beautiful kitchen features subway tile, stunning fixtures and cozy office nook. Enjoy all the East Side has to offer. Walk to Launderette, La Barbecue, Cenote and more!